Heavy Ice is a novel about first contact and the mutual incomprehension, wheeling and dealing over mineral rights, explosions, revolutions, religious upheavals, exploration of dead Spires, romance, duelling, intrigue and getting drunk that happens next. It features a heroine who doesn’t like people telling her she’s stupid, a hero on the run for reasons of his own and a xenoraptor who is basically a smart, semi-aquatic tyrannosaur. 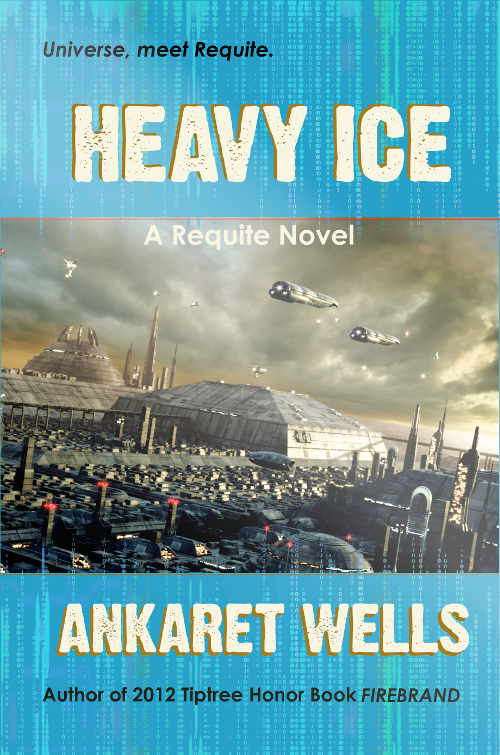 Heavy Ice is set two hundred years or so after the first two Requite novels, and makes the occasional reference to them but can be read as a stand-alone. Requite sidereal date: 5-1 Silver, 650 S.F: adjusted standardised date (ASD) 16.01.4911: Prémontré Spire, Requite. Vane was in the deep levels of the Retort. He’d never been particularly comfortable here, and he didn’t feel comfortable enough to assemble himself a body now. He disliked the lack of familiar kerubs. Even more, he disliked the drumbeat of error messages that echoed around him. The Prémontré Retort had been set up by someone who liked getting an error message every time the Retort did anything at all. Vane found it as helplessly infuriating as he had found being put into scratchy cloth-of-gold robes when he was a child; and just like then, his discomfort echoed louder and louder inside his own self because no one outside would pay heed to it. Vane shivered, even though he had nothing to shiver with. He was nothing but a point of consciousness, feeling the vast shifts of the Retort’s workings around him like a fly perched on the inside of a great tolling bell. Scraps and commands of data vibrated through him as the Retort went about its business of keeping the air flowing and the water clean and the contamination out. Pel arrived beside him. She had no trouble assembling a coherent imagined-body here in the deep levels. It even looked like her, which certainly wasn’t always the case with Makers. His epicon-grandparent had looked young and limber in the Retort, right up to the end; Albé, by contrast, always showed up in the Retort looking careworn and about thirty-five. Pel was wearing a long green waistcoat intricately cut and laced to fit her shape instead of her usual all-enveloping coat, and her hair reached up a good ten centimetres higher than in reality, but otherwise she was simply Pel as he’d last seen her. Even the lizard-patches matched. “Well, maybe this will change your mind.” Pel affixed her glyph to the template. Reluctantly, Vane did likewise. And was elsewhere. In a cold bare room that he could tell was a Retort-construct, with the star of God emblazoned on ceiling and floor. A woman was standing there, looking impatient. She was small, and hawk-nosed, and dressed in the fashions of a hundred and fifty years earlier: hair strangely puffed out at the sides, a mannish doublet, and a long thick skirt that looked as if she might at any moment need to ride side-saddle for a longday. Over it all hung the olive-and-gold cloak of a Maker-Chaplain. Someone else must have done up all those ties and fastenings, because her hands were encased in long, olivine-studded fingernail protectors. She fixed Vane with her gaze, and he was helplessly reminded of his godmother. Once again, she fixed Vane – or the nanes doing the recording, he supposed – with heavy-lidded eyes, set under black brows that winged upwards in a storm of small lines at her temples. He had an impression of shocking intelligence, and even more formidable will. She lowered her eyes. The stars in the ceiling and floor glowed. She lifted the glittering claws on her hand, and looked at them, as if seeing the ghost of someone else’s long fingernails. The olivine stones glinted like frozen moss. Something shone briefly between them, like a glitching hologram: a little spinning globe, with smaller globes flying around it like droplets of coloured water. Copyright © 2013 Ankaret Wells.